Last night in Germany fight fan saw Japan's Tamao Ozawa (13-5, 5) [小澤瑶生] put on a stirring performance, but come up agonisingly short against German veteran Raja Amasheh (21-1-1-1, 4) in a bout for the vacant WBO female Super Flyweight title. The details from the contest are scarce but officially the bout was scored 96-94 to Amasheh by all 3 judges, in what sounds like a very debabteable decision. From what we understand Ozawa was aggressive through out, and took the fight to Amasheh, though with the crowd behind the local fighter it wasn't to be for the visitor, who is now 0-2 in world title bouts, having previously lost to Su Yun Hong in a Light Flyweight title fight. As for Amasheh the bout sees her secure a career defining win, though it would like her reign will e a short lived one, given she only just managed to get the win here. Ozawa will clearly go back to the drawing board wnd will likely look for another world title fight, though the former OPBF female champion will know that she won't get many more shots following two recent losses at the top level, even though both were very close decisions on the score cards. Tomomi Takano spanked in world title fight! It's often said that boxing is about levels. That was seen on Wednesday when Tomomi Takano (8-2, 5) found herself coming a long way short of world class, as she was battered by WBO female Super Flyweight queen Daniela Romina Bermudez (18-3-2, 6) in just 4 rounds. The bout was Takano's first world title bout and her inexperience at this level as she was completely with out an answer to Bermudez. In the opening round Takano looked uneasy despite having some success. Her success, from her straight punches, seemed to come as much from what she was doing as from what Bermudez was doing, with the challenger easing herself into the bout and trying to ease herself into the bout. In round 2 Bermudez got out of neutral and it looked like that alone scared Takano who did well to hold her own at times, was made to look very uncomfortable by Bermudez who was finding her way inside all too easily. In round 4 Bermudez stepped it up again and this time she landed a combination that ended only when Takano was dropped. The knockdown swiftly resulted in the towel being thrown in. Following the loss Takano was said to be planning to rest and would then consider her future. From this performance however it could well be that her skills have reached their limit and her short reign as an OPBF title holder may well be the high point of her career. For those wanting to watch the final moments of the fight, we've included the video below. Earlier today fans at the Korakuen Hall got the chance to see the highly skilled Naoko Fujioka (12-0, 6) successfully retain her WBA female Super Flyweight title as she repelled the challenge of the talented Tomoko Kawanishi (9-2, 4). The bout started pretty well for the challenger who used her superior reach and height to great effect early on by letting loose with her jab and straight shots. Not only was Kawanishi using the right tactics but she was also looking very sharp, in fact some would suggest she had never looked so good in the ring. Although Kawanishi had clearly stepped up her game it still wasn't enough to over-come Fujioka who managed to find her rhythm in round 2 and began to cut the distance a little bit. On the inside it was Fujioka landing the hooks and uppercuts and neutralising the difference in size. It was great back-and-forth between two fighters who were trying to prove their world class skills and for the first half of the fight it was brilliantly competitive 2-way action. The proof of a fighters skill is their ability to adapt, to change their tactics and to take over a bout. In the second half of the contest it was Fujioka who managed to adapt whilst a tiring Kawanishi began to unravel and tire. The heart was still there from the challenger but by round 8 it was clear that Kawanishi was begin to show signs of fatigue and this seemed to spur on the champion who found the time and space to dominate the final few rounds and put the bout beyond any doubt. Despite the competitive action early on the judges all agreed on the score of the bout awarding the decision to Fujioka with scores of 97-93 to allow her the first defence of her title. Although Kawanishi came up short here she did show enough to suggest that she has the ability to win a world title somewhere down the line. As for Fujioka it still seems that she's effectively unbeatable at 115lb and hopefully a big name opponent will be her next challenge. 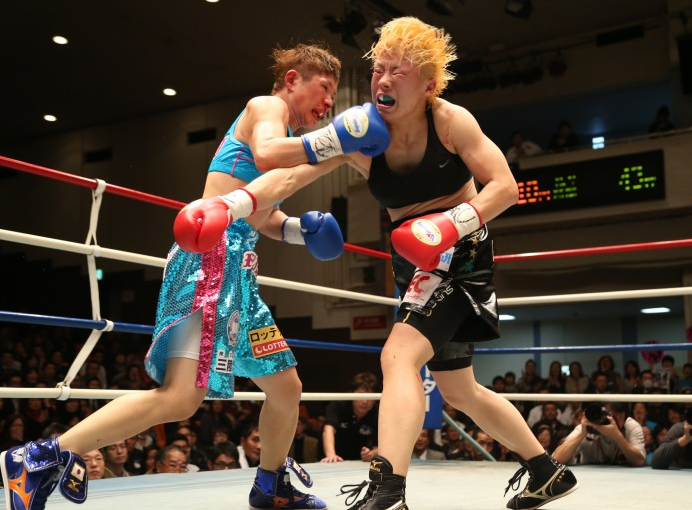 It's not often a female fight can genuinely get the attention of a filled venue but that's exactly what happened earlier today as Japanese boxing had one of the few major female fights of the year. In one corner we had the destructive and big hitting Naoko Yamauchi (22-4-3, 18), the defending WBA Super Flyweight champion, in the other we had Naoko Fujioka (11-0, 6), a fighter who was jumping up from Minimumweight where she had previously held the WBC title. The general view seemed to be that Yamaguchi went in to this bout as the power puncher whilst Fujioka would be the cautious fighter using her movement and speed to try and over-come Yamaguchi's natural strength and power. What we got however was a masterclass of boxing from Fujioka who showed all the skills of a genuine elite level fighter. From the opening round it was obvious that these two were in totally different classes. Fujioka, boxing and moving, was landing her jab, her straight and her hook almost at will. It was obvious that she was wary of Yamaguchi's much vaunted power, especially in the defending champion's right hand, though she was avoiding it with ease before firing back her own shots. As the rounds went on Fujioka became more and more confident. She continued to land her shots at will but became less and less worried about the power of Yamaguchi, in fact when they did trade it was Fuijioka's power that had the lasting effect and not Yamaguchi's with Fujioka scoring a knockdown in round 3 as she continued to dominate. Whilst Yamaguchi was struggling to land her punches round 4 did see her hurting Fujioka, albeit from a headclash which was one of the few times we saw Fujioka in any sort of pain at all. Unfortunately for Yamaguchi she was punished by Fujioka for the clash of heads and staggered late in the round. By round 7 it appeared that Fujioka was set on taking Yamaguchi out. The challenger had Yamaguchi staggering several times as she hunted a second knockdown though Yamaguchi showed great heart in seeing out the storm and hearing the bell. By then though the fight was a lost cause. After a strong Fujioka round in the eighth it really was all over barring Yamaguchi scoring a knockout, something that had seemingly become impossible due to the fact Fujioka took her shots so well. Despite that Yamaguchi did manage to arguably claim the final two rounds which included a scrappy round 9 and a good back-and-forth round 10. By the time we got to the final bell there was only ever one winner. With or with out the knockdown Fujioka had clearly taken the decision and the title as she scored arguably the most notable victory of her career and took home her shiny new title. -The official scores were 98-91, 97-92, 97-92. We had it 98-91.